Twenty years have passed since twelve students and one teacher were murdered by two students at Columbine High School in Littleton, Colorado. It seems that the word ‘Columbine’ is so infamous that is requires no explanation. Arguably, there were school shootings prior to the 1999 attack at Columbine High School that were just as shocking: for instance, the Westside Middle School attack in 1998 perpetrated by students aged eleven and thirteen years old. Over the past two decades since Columbine, there have been numerous horrendous school shootings, including ones at Sandy Hook Elementary School and Parkland High School. There have also been mass shooting incidents with a higher death tool such as the Pulse Nightclub massacre and the Las Vegas Strip shooting. None of these, however, have ever quite had the impact of Columbine. Unfortunately, Columbine also appears to have motivated school shootings that have occurred in the past two decades. It is claimed to have inspired seventy-four ‘copycat’ plots, twenty-one of which actually became mass shootings in schools and other locations. (3) Furthermore, in a compiled list of school shootings from 1999-2007, seven out of nine in the United States and six out of eleven occurring elsewhere in the world referenced the Columbine incident. (4) Some of the other more noteworthy attacks like the shootings at Virginia Tech University in 2007 and Sandy Hook Elementary School in 2012 have involved perpetrators who were interested in the Columbine perpetrators. Thwarted school shooting plots, such as one at Radnor High School devised by a female student, have involved individuals fascinated with the Columbine perpetrators. There was even a threat made against Columbine High School itself this week, made by a female perpetrator who was said to be ‘obsessed’ with the Columbine incident. (5) It appears that the Columbine shooters have become somewhat of a role model for the disenfranchised. (4) Larkin, Ralph W. 2009. “The Columbine Legacy: Rampage Shootings as Political Acts.” American Behavioural Scientist 52: 1309-1326. This entry was posted in Uncategorized and tagged Columbine High School, copycat effect, Las Vegas Strip mass shooting, Parkside High School, Sandy Hook, school shootings, Westside Middle on April 20, 2019 by SKerr1. 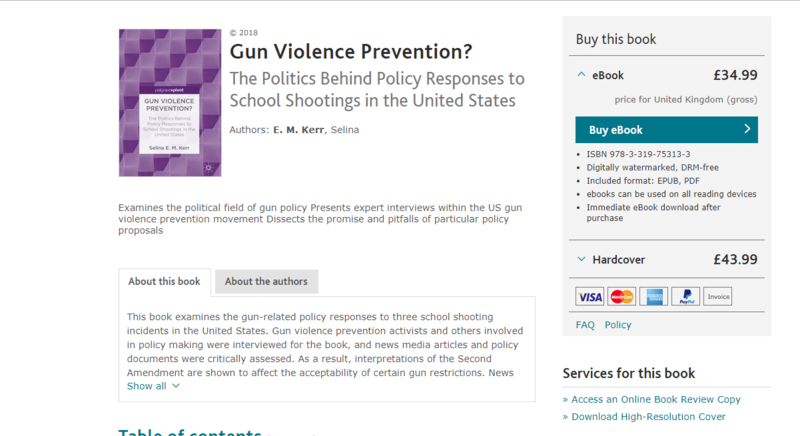 Read my new book about the gun-related policy responses to school shooting incidents in the United States. 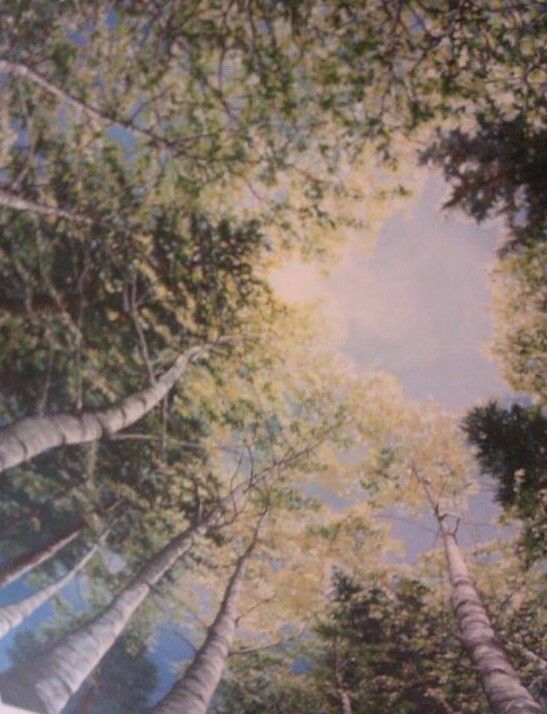 This entry was posted in Policy and tagged Columbine school shooting, gun legislation, gun violence prevention groups, news media coverage, policy debates, policy solutions, presidential elections, Sandy Hook school shooting, school shootings, Virginia Tech school shooting on April 28, 2018 by SKerr1. The previous blog post compared and contrasted a handful of European school shootings with American ones and found that there was not much difference in the motivations and actions of perpetrators. This post will follow up on that looking at the aftermath of school shootings across different cultures. Starting with European incidents, the Jokela school shooting in 2007 was discussed at length in a blog post published on the 25th of September 2017. The aftermath of this school shooting involved a number of recommendations centring on creating a better school environment and helping students: improving student welfare and ensuring the relevant authorities (e.g. social work) cooperate; clarifying mental health disorders such as adolescent anxiety; devising and implementing school safety plans; formulating programs to tackle bullying. More importantly, a report by the Ministry of Justice in Finland acknowledged that the perpetrator ‘copied school killings perpetrated in the USA’ with his use of a firearm with him being a legal gun owner. Recommendations, therefore, centred on more stringent checking of who is permitted to have a gun permit and greater use of fixed-term permits. Another point raised in this report was the fact that the perpetrator engaged in online discussions about school shootings prior to his attack and also used the internet to promote his manifesto. It was advised that administrators of online communities should stage interventions in such cases and moderate content more closely. Looking at the German Winnenden school shooting (2009) finds that this lead to the passage of gun legislation intended to improve handgun security: a nation-wide registry of gun owners, increased age limits for purchasing guns and unannounced inspections at homes to check guns were stored securely. Since the perpetrator stole his firearm from his father, this case also led to a lawsuit being filed against the father. As it transpired, his father was found guilty of involuntary homicide caused by negligence with a weapon. Another example was the Dunblane school shooting in the United Kingdom in 1996, which led to a more or less ‘blanket ban’ on handguns in the UK. Current gun owners were encouraged to return their guns after the 1997 law was passed and the criteria on who was allowed to own a gun became very strict, with people requiring a valid reason for doing so. Looking at the United States now finds that earlier school shootings in the 1990s (e.g. Heath High School, Pearl High School, Westside Middle School) led to a ‘Conference on School Safety’ held at the White House in 1998. Responses centred on anti-bullying programs, reducing youth violence more generally, greater parental involvement and creating networks of support within the community. When the Columbine school shooting occurred in 1999, this expanded the scope for debate to violent entertainment media, ‘goth culture’ and gun laws. There were some provisions in place regulating violent media for a while and schools began developing emergency management plans to deal with active shooter incidents. Zero tolerance disciplinary measures were also implemented across a number of schools for carrying weapons, wearing certain types of clothing or any other action deemed ‘risky.’ Proposals were raised around children and guns but these never gained traction in Congress. The main changes to guns came at the state-level following Columbine. School shootings since then have resulted in changes to mental health laws and some restrictions on guns at the state-level. Similar to the Winnenden school shooting, some incidents in the United States have resulted in the parents of victims filing lawsuits against the parents of the perpetrators (e.g. Columbine) or in some cases other targets like the film industry on the basis of it influencing the actions of the shooter (e.g. Heath High School). Contrasting the responses to school shootings across cultures is indicative of the differences. The motivations of school shooters are rooted in feelings of marginalisation, possibly being bullied and the need to get ‘revenge’ against the institution, no matter which country the attack took place in. When it comes to the aftermath, however, European countries have taken overt steps to tighten gun laws in response to school shooting incidents. In the United States, this has not really been the case for the entire nation; any gun restrictions have arisen at the state-level only. The similarities between the U.S. and European countries have been to improve the school culture and provide assistance to students who are struggling with mental health or other personal problems. In ensuring that responses to school shootings help to avert and negate future attacks, countries should try working together and sharing strategies about what has worked best for them. This entry was posted in Cultural Dimensions and tagged Columbine High School, Finnish school shooting, gun legislation, Heath High, Jokela school shooting, Pearl High, school shootings, Westside Middle, Winnenden on November 15, 2017 by SKerr1. In a blog posted on the 1st of October 2014, the reasons why the United States has the highest number of school shootings in the world were outlined. A culture rooted in individualism, hyper-masculinity and high levels of private gun ownership were said to be contributing factors to an elevated rate of incidents. This post will compare and contrast trends in school shootings in the United States with those in Europe to determine whether cultural differences affect the motivations and unfolding of school shootings. To narrow the selection from the high population of incidents, this post will only focus on a selection of those occurring from the 1990s onwards. Starting off with the European incidents, the Dunblane Primary School attack in 1996 was the only school shooting to have ever occurred in the United Kingdom. This involved an outside adult male perpetrator who killed sixteen children and their teacher. The perpetrator had been suspended from youth clubs he ran due to suspicions about his ‘intentions towards young boys’ and had felt extremely aggrieved by this, even writing to the Queen and his local politician to complain. It may be surmised that the primary school and a class of its youngest students aged five and six was targeted because they represented innocence. The other European school shootings have mainly taken place in Germany and Finland. Beginning with German incidents, the 2002 Erfurt massacre resulted in sixteen deaths, most of which were teachers. The perpetrator had recently been expelled from the school and this was an act of revenge against the institution. In the 2006 Emsdetten shooting five were killed by a student who felt he was ostracised and labelled a ‘loser’ at the school. The perpetrator posted an advanced warning about his intentions in an internet forum and also left material to be found after the massacre. Another German school shooting was in 2009 in Winnenden, where the perpetrator was a former student whose poor grades had meant he was unable to enter an apprenticeship. Twelve were killed at the school and the perpetrator then fled the scene and went onto shoot other people outside, ending up in a shootout with police in a car showroom. In Finland, the Jokela school shooting in 2007 resulted in eight murders. The perpetrator, who had been bullied at school, showed an intense interest in other school shooters and a hatred of humanity. He also uploaded his manifesto online prior to the massacre. Another high-profile incident resulting in ten victims took place in Finland in 2008 at a university in Kauhajoki. Similar to the Jokela attacker, the perpetrator admired school shooters and expressed hatred towards mankind. Our attention will now turn to a handful of the incidents that have occurred in the United States from the 1990s onwards. One of the most shocking of these was the Westside Middle School massacre in 1998 in which five were murdered. The reason this was shocking was because the perpetrators themselves were aged eleven and thirteen and went to a degree of planning: letting off the fire alarm and then shooting people when they left the building. Another school shooting occurred in Heath High in 1997 and involved the perpetrator firing a gun into a prayer circle of girls. The Pearl High incident in 1997 resulted in the murder of the perpetrator’s mother and two girls at the school. In the case of these three incidents, perpetrators were said to have felt persecuted by other students and suffered from bullying. Additionally, they had their romantic advances spurred by girls: the Pearl High shooter killed his ex-girlfriend and the Heath High perpetrator shot a girl he had a crush on during his attack. The Columbine High School Shooting in 1999 is arguably the most infamous of all school shootings in the United States due to its shock nature and the fact that parts of it played out on live television. Another incident occurred in Red Lake High School in 2005, where the perpetrator killed his grandfather and companion at home and then went on to kill another seven at his school. The perpetrators of the Columbine and Red Lake school shootings had expressed disdain for mankind, admiration for extreme ideologies and believed they were superior to others in their intellect. Comparing the motivations of the European school shooters with the United States ones finds these are relatively similar. The Finnish school shooters appeared to be admirers of the Columbine school shooters and shared similar ideas about humanity. If a difference had to be flagged, it could possibly be that a couple of the European cases involved expelled students and were perhaps more clear-cut examples of ‘revenge’ than some of the other cases. Overall, the themes of bullying, rejection, feeling like a ‘loser’ are prevalent throughout all the case studies discussed here. This entry was posted in Cultural Dimensions and tagged Columbine school shooting, Emsdetten, Heath High, Jokela school shooting, Kauhajoki, Pearl High, Red Lake High, school shootings, Westside Middle, Winnenden on October 18, 2017 by SKerr1. In the blog post published on the 22nd of June 2014, I outlined the ways in which promotion of an identity constructed before a school shooting is a ‘performance’ intended for a particular audience. This post will follow up on this, by looking at the specific example of the Jokela High School incident on the 7th of November 2007. In this case, the eighteen year old perpetrator, Pekka-Eric Auvinen, put together a manifesto package explaining his motives. Prior to this, he engaged in online discussions about school shooters and gave some indication that he would perpetrate his own attack. Eight were killed in the attack perpetrated by Auvinen in an attack on the upper (secondary) school within the Jokela School Centre. Similar to other school shootings, this incident had been planned well in advance. Preparations for Jokela were thought to have started in March 2007 based on Auvinen’s diary entry at that time, which stated intent to carry out an ‘operation against humanity.’ Also included in that diary entry was a desire for this ‘operation’ to be infamous with a lasting impact on society and to inspire others to carry out similar acts. These sentiments were echoed in online debates Auvinen engaged in, taking place in internet communities dedicated to discussing the Columbine school shooting. Auvinen’s interest in this particular attack was explicated in him making a video about the incident: for instance, he put together a montage from the surveillance camera footage of the Columbine attack. Researchers found that the ties to these online groups magnified Auvinen’s desires and went some way to encouraging him to follow through with these in a proper attack. (1) Corresponding with others interested in school shooters has been a feature of other school shootings: for instance, the perpetrator of the Sandy Hook attack compiled a spreadsheet about school shooters and discussed them in detail with others online. (2) In the case of the Jokela school shooter, a clear intention to carry out a school shooting was expressed; although this lacked concrete details such as a date and location. Considering all of this, it is clear that the online discussions helped both to cultivate an audience for Auvinen and provide him with further details about school shooters. It was clear he admired the Columbine school shooter, Eric Harris, and this was echoed in his manifesto comments about ‘natural selection’ and humanity. This was exemplified further in Auvinen preparing a detailed final manifesto to portray himself and his beliefs in a certain way before carrying out the attack and sending this to the media with the belief that this would bring maximum publicity. Oksanen A., Nurmi J., Vuori M., Räsänen P. (2013) ‘Jokela: The Social Roots of a School Shooting Tragedy in Finland.’ In School Shootings, edited by Böckler N., Seeger T., Sitzer P., Heitmeyer W. New York, NY: Springer, 189-215. The dangers of ‘school shooter admirers’ was discussed in my blog post published on the 29th of June 2014. Accordingly, he picked the user name ‘NaturalSelector89’ for his user account on YouTube. See page 208 of Oksanen A., Nurmi J., Vuori M., Räsänen P. (2013) ‘Jokela: The Social Roots of a School Shooting Tragedy in Finland.’ In School Shootings, edited by Böckler N., Seeger T., Sitzer P., Heitmeyer W. New York, NY: Springer, 189-215. This entry was posted in Uncategorized and tagged Columbine, fan admiration, Finnish school shooting, Jokela school shooting, manifestos, multi-media packages., news media coverage, online threats, Sandy Hook, school shooter admirers on September 25, 2017 by SKerr1. Continuing with the global theme discussed in the last blog, this post provides an insight into the 2002 school shooting at Gutenberg High School in Erfurt, Germany. This attack resulted in the murders of seventeen victims, as well as the suicide of the shooter. In this blog, I will advance the argument that this incident was an exercise in ‘revenge’ against the institution. Outside of the family system, school is the social institution which adolescents have the most interaction with. (1) Prior to the attack, the perpetrator, Robert Steinhäuser, was said to be struggling at school, having failed a required entrance exam for university admission. This was coupled with a series of absences from classes. When it was discovered that he had forged medical notes to exonerate him missing classes, he was subsequently expelled from school — something he kept secret from his family members. Having found himself in this predicament (and not sharing this with those closest to him), Steinhäuser’s next course of action was to carry out an attack on the school. It has previously been argued that school shootings in the United States perpetrated by adolescents have been attacks on the institution itself. (2) The Erfurt massacre was another example of this, evident in the fact that Steinhäuser purposefully targetted his former teachers during his shooting attack. In the end, fourteen of the seventeen murdered were staff members at the school; the remaining three victims included students and a police officer responding to the incident. Before killing himself, Steinhäuser stated “That’s enough for today” as though his intended target had been met. Given the fact that Steinhäuser had been expelled from the school, it is clear that this massacre was part of a ‘revenge’ attack against the institution. As a concept, revenge differs from ‘punishment’ and ‘retaliation’ in its proportionality, motivations and consequences. Revenge is said to be more ‘emotionally complex’ in that it involves a perceived wrongdoing on behalf of the enactor. The intention of revenge, therefore, is to ‘diminish one’s opponent’ by taking direct action to harm them. (3) Since institutions are said to be “reflections of the people in them” (4), the Guternberg High School seemed to Steinhäuser to represent the source of his problems. Notably his purposeful gunning down of teachers and others who got in his way, such as the police officer responding to the incident, is indicative of this. Overall, it could be said that the Erfurt school shooting was a vengeful mission predicated on the assumption by the perpetrator that the school, as an institution, had ‘wronged’ him. (1) Cullingford, C. (2000) Prejudice: from individual identity to nationalism in young people. London: Kogan Page, 99-100. (2) Harding, D. J., Fox, C. and Mehta, J. D. (2002) ‘Studying rare events through qualitative case studies: lessons from a study of rampage school shootings.’ Sociological Methods Research 31(174), 189. (3) Govier, T. (2002) Forgiveness and Revenge. New York and London: Routledge, 20, 36. (4) Cullingford, C. (2000) Prejudice: from individual identity to nationalism in young people. London: Kogan Page, 203. This entry was posted in Psycho-social Factors and tagged Erfurt massacre, Germany, Guternberg High School, power, revenge, school shooting, violence on August 23, 2017 by SKerr1. I have been busy with my book and other projects over the past year. Monthly blog posts will resume late August 2017. This entry was posted in Uncategorized on August 6, 2017 by SKerr1.